The Guyana Power and Light Incorporated (GPL Inc.) today, donated a $300,000 cheque to the Guyana Table Tennis Association towards its ongoing international tournament. GPL’s Public Relations Officer, Shevion Sears told the Department of Public Information (DPI) that this donation forms part of their corporate social responsibility which involves supporting community and youth development. 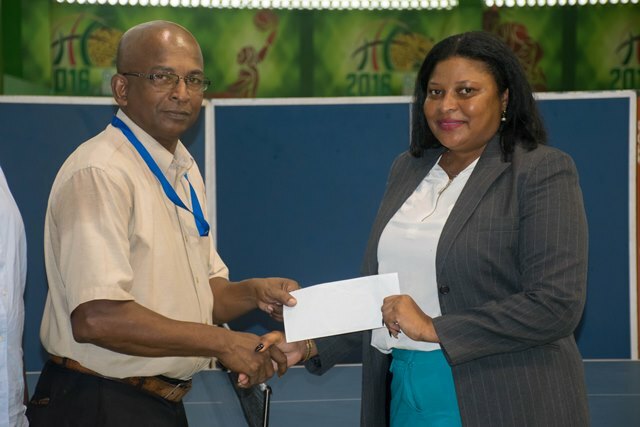 Public Relations Officer, Guyana Power and Light Incorporated (GPL Inc.), Shevion Sears presents the cheque to General Secretary, Guyana Table Tennis Association, Linden Johnson. “We are proud because several young people are out there participating in the tournament. They are representing Guyana and we’re looking forward to seeing them win, whether gold, silver or bronze. We have confidence in them, hence we are supporting them,” Sears explained. General Secretary for the Guyana Table Tennis Association, Linden Johnson, also expressed his appreciation for the support. He said the money will go towards assisting the pre-cadet teams at the Caribbean Championship in Santa Domingo. Johnson described GPL’s coming on-board as the birth of a good relationship and a plus for table tennis. According to Johnson, the association currently has a senior team in Jamaica who have copped three silver and two bronze medals. The competition for the 21-years-and-under category began today and will be followed by the senior’s singles competition. Some of the funding from GPL will assist the seniors to assist with accommodation. GPL has also made donations towards national development. During 2017, the utility company donated to the Guyana Amateur Basketball Federation, in honour of the Company’s 18th Anniversary celebrations. They also donated a quantity of furniture to the Ptolemy Reid Rehabilitation Centre and in observance of Cancer awareness month, donated $400,000 to the Cancer Institute of Guyana.